I followed the women in front of me, a tub full of dirty clothes on my head, my hands there to steady the tub. As I walked, one shirt fell onto the path in front of me and then another one. Embarrassed, I stopped to pick them up. No one else was dropping clothes; not even my daughter who walked with a tub on her head just in front of me. Working with World Vision and community volunteers, we were carrying the filthy clothes of four young orphans living on their own in a hut in a small village near Butha Buthe. We were Americans in the small country of Lesotho with different customs, different talents and different skills. I learned quickly that carrying heavy objects on my head is definitely not one of mine. I followed the women down the path to the river and watched as they emptied the clothes on the rocks, filled their tubs with water and added powdered soap before scouring the children’s clothes. We scrubbed and scrubbed, squatting and kneeling on the rocks, the sun warm but the air cool, our hands immersed in the cold river water. 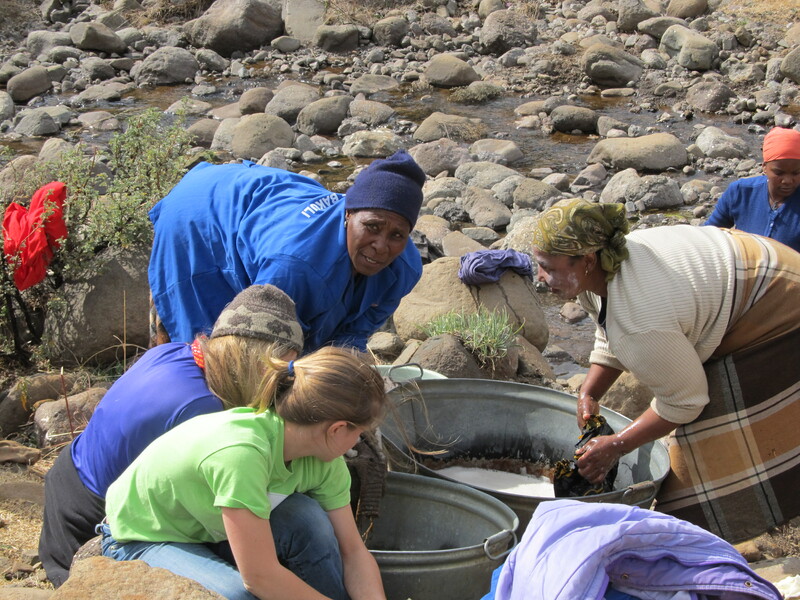 As we washed, the women around us talked and laughed in a language we didn’t understand. My daughter watched closely and mimicked them, learning quickly how they scrubbed without splashing. I cleaned the only way I knew how, hands holding the cloth together, rubbing in an even rhythm. With eyes big and intent, she responded, “GaliboHA,” accenting the last syllable. I tried again, “GalliboHA!” I said, loud and clear. She laughed and laughed, and the other women laughed with her. She pointed to my daughter. “Better than you!” she said and laughed again, showing me how they scrubbed the red dirt from their clothes, two short scrubs ending with one long stroke. I smiled and tried to copy their ways, moving my hands together as if I was making music with sandpaper blocks. 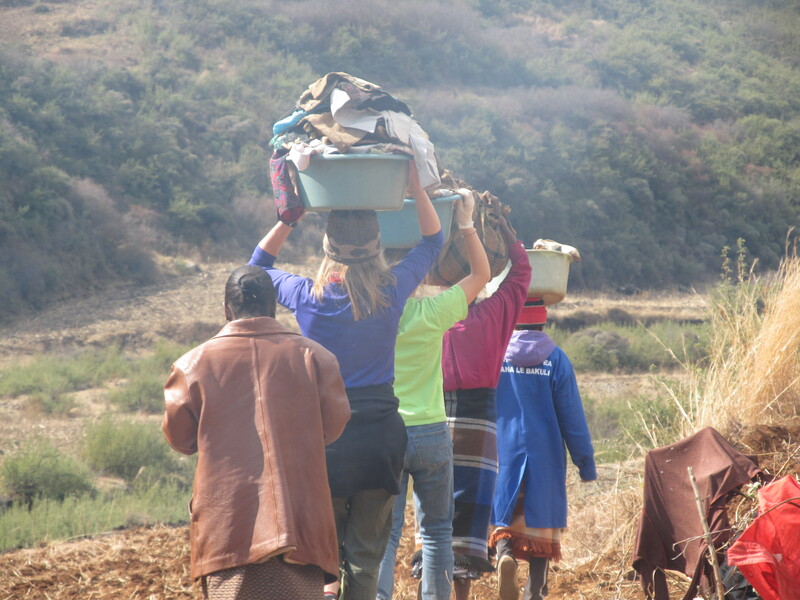 The women continued to talk in the language of Lesotho, but now we all laughed easily. The brown shirts turned pink and blue and yellow, the once clear water in the tubs now the color of dirt. Clean clothes lay on the rocks drying in the sun. Back home, I scrutinized the photographs. No wonder clothes kept falling from my tub onto the path in front and behind me. My tub was piled higher than anyone else’s as we walked down to the river. Photos on this post by Tommy Taft. ← Is It Safe to Walk into Town?